On our recent trip to Victoria, we collected lots of bits of paper. Today, I rummaged, looking for anything with a map on it. Could I put together my own online exhibition of maps? The National Library’s Mapping Our World exhibition got me thinking. I won’t presume to produce anything as elaborate and insightful. I did wonder if I could manage some humour, but perhaps not. If nothing else, thinking about the holiday from a different angle will help the old brain store the memories. The collection started before we left when I purchased the Hema state map of Victoria (8th edition). These maps tease when first purchased. Details are hidden in folded caverns. This is the style of map that many filmmakers used for slapstick humour as the hapless stooge attempts to re-fold it, sometimes against the wind, in the vain hope of restoring the original arrangement of panels. To use this map in transit, you go against the grain. 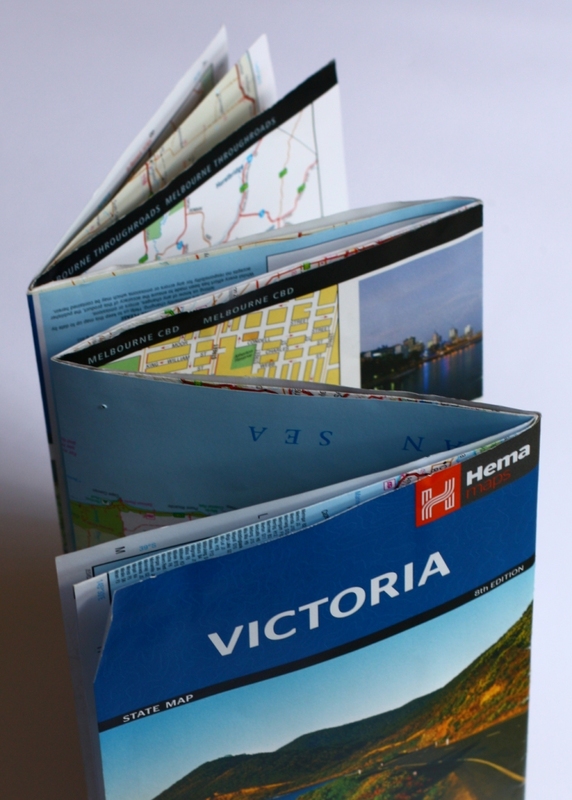 It must be refolded, repeatedly, into a smaller size with only the needed panels showing. The road sign said “Yarrawonga”, but I couldn’t find it on my map. I looked this side and that. We successfully reached our destination regardless, and with map now spread out to prepare for the next day … there it was … “Yarrawonga” … sitting right on the crease line. It wouldn’t have mattered how many times I flipped it back and forth, I was never going to look ON the crease line. The next size down in this growing collection are the town maps. They sit on the Information Centre’s counter, all glued together on one side, requiring a gentle yet persistent tug as you claim one of these oversized pieces of marketing for yourself. Sometimes they’re useful for finding the exit road, particularly if you’ve lost sight of the main thoroughfare/s after searching for a tourist site. They come crisp and uncreased but too big to handle without a few folds. By the time you grab one of these, there’s a good chance your hands are already full. A rough attempt is made to down-size the beast and then it gets shoved into the side compartment of the car door until needed, if needed. 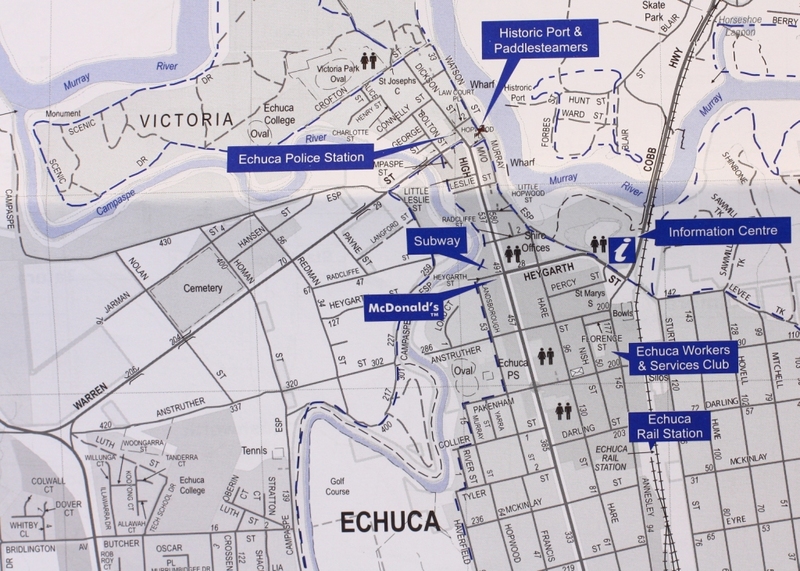 I found an interesting comparison between Eucha’s version of this beast and a smaller map inside the Official Visitor Guide booklet. The booklet makes the historic precinct standout by prompting the question “Why is that the only brown bit?” and triggering closer examination. The beast, in the other hand, ranks the paddle steamers no higher than the Workers Club, the Racing Club, KFC and Subway. Interestly, McDonalds is in bolder print; perhaps it contributed more sponsorship dollars or perhaps it’s just more important! 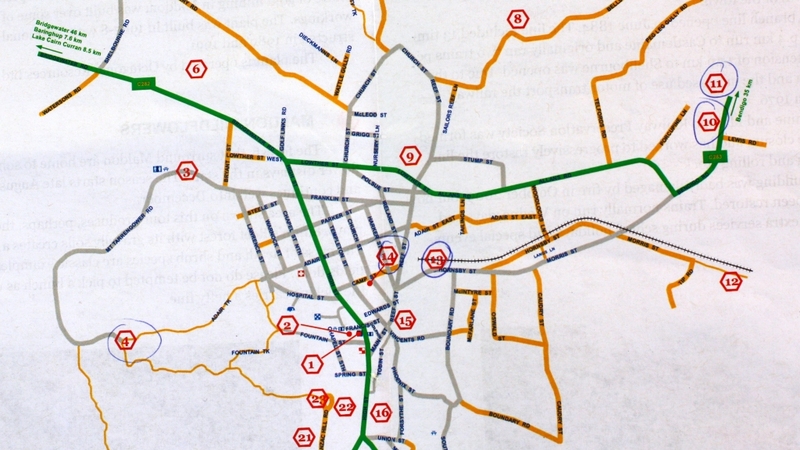 Next on the sliding scale of size are the town touring maps. We collected a bunch at Maldon. More correctly, a bunch were thrust upon us by an eager enthusiast. 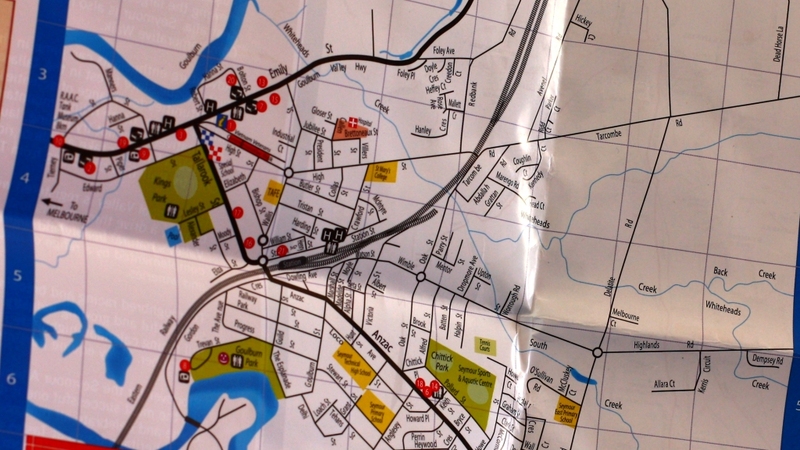 We used one to review the list of tourist sites, selected a few of interest and circled the numbers on the map provided. Then, I managed to completely forget one … the one that I was particularly interested in, the old railway station. The trick to travelling with maps is to remember to refer to them, regularly. My tip: Look at the map first, then your watch. The home-made maps are nearly my favourites. We scored two of these, one from each campground we stayed at. They couldn’t be more different. 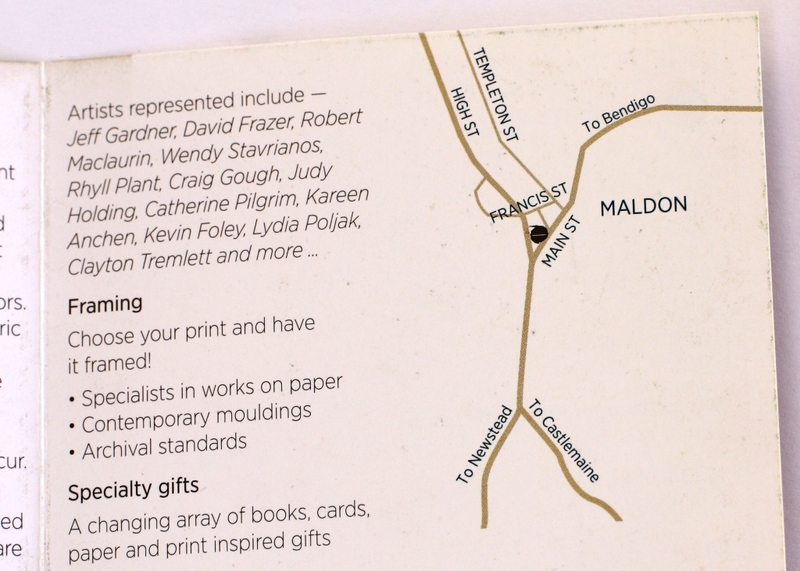 Maldon is hand-drawn and photocopied – probably two to a page. We got the bottom half. 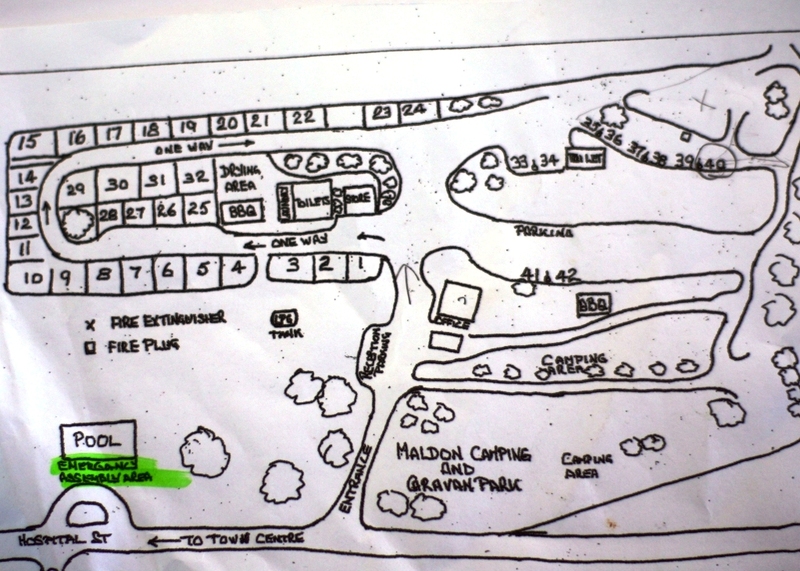 This was a campground of terraces and curves, nestled in trees. I think the map reflects this beautifully, personally, where even the cut edge shows the unevenness of the human hand. In contrast, Benalla produced a computer-crafted grid that actually reflects the pristine grid and clipped grass of the grounds. It’s ideally suited to those who like tidy, with nothing out of place. 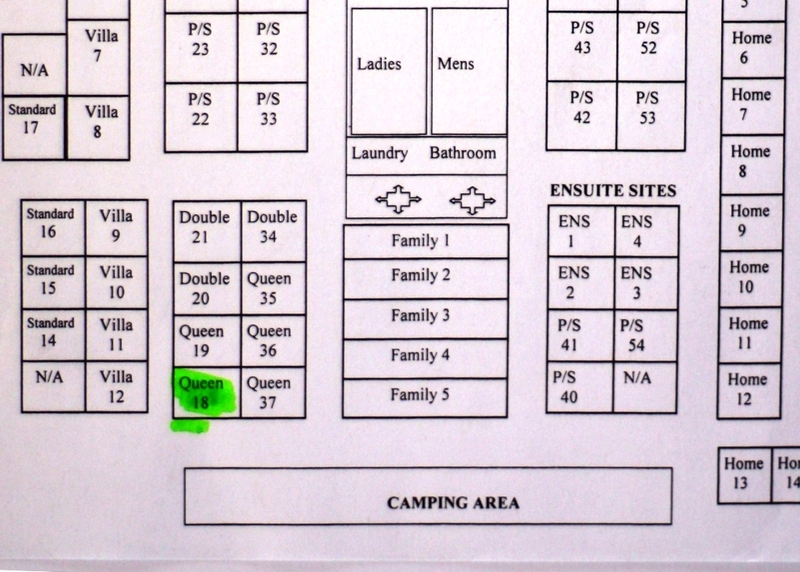 Thankfully, the rain prevented us from setting up the tent and we stayed tucked away unseen in a cabin instead. (Yes, I’m an untidy traveller, but in my defence I always leave the room or cabin very tidy on departure). That brings my little online exhibition to the smallest maps we collected on our journey. 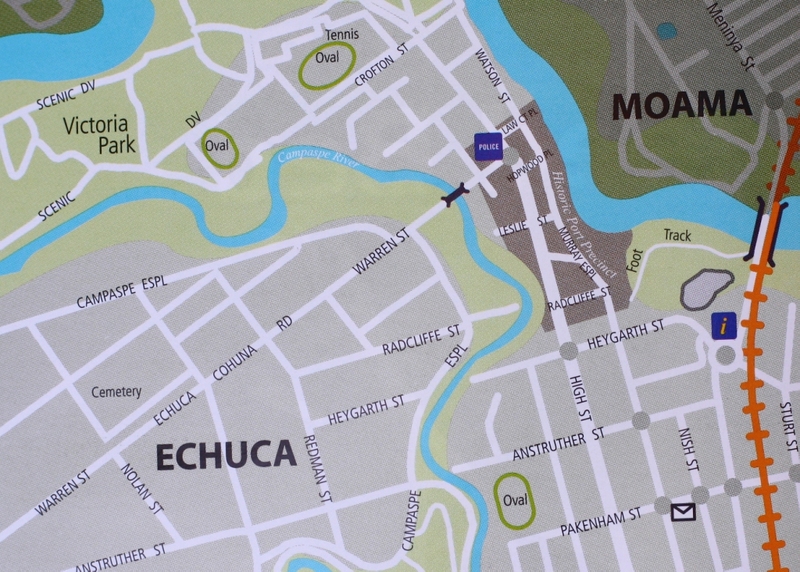 Cultural institutions of all sizes often include a tiny map on the marketing brochure. Because it is a marketing brochure, the design of the map will accord with the institution’s reason for being, the selling point, the theme. 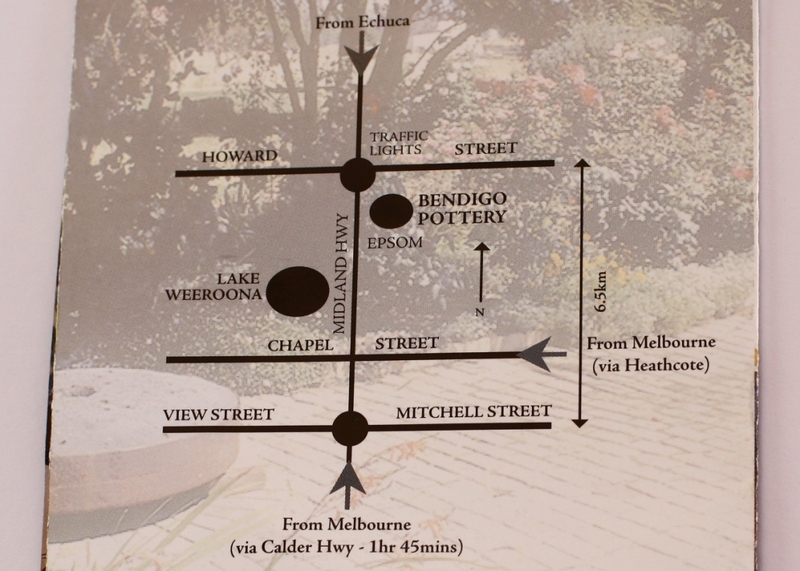 For example, Bendigo Pottery sells itself as “Australia’s oldest working pottery”. It’s not a studio where a single artist or two create new and interesting pieces designed to fill an untapped market niche. Instead, it’s an artisan factory producing bulk runs of quality pottery pieces for a commercial market. 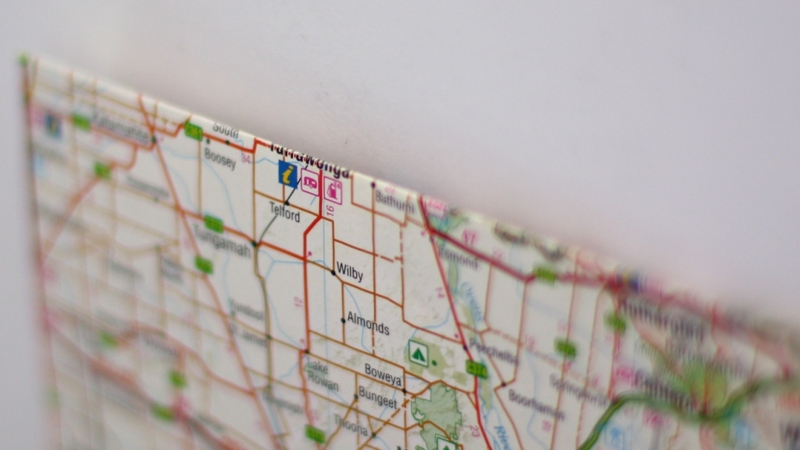 The brochure map is functionally efficient, in an industrial way. In contrast, the Cascade Print Room in Maldon is very organic; the figure is almost human, waving open arms in greeting. Check out its website and you’ll understand why I think this map is a great fit for the place. PS: Both Bendigo Pottery and Cascade Print Room were wonderfully friendly and welcoming – highly recommended. An exhibition is usually prepared by a curator, who selects and interprets the objects, and who then delivers a Curatorial Statement to explain the choices made. My choices for this little online exhibition aim to reflect the variety that is available. That variety is born of many perspectives and many purposes for which the maps were created. In contrast, the screen display on a smart phone or tablet, or the now already old-fashioned spit-licked sat nav on the windscreen, yields no such variety. It is life according to the world-view of the single company that owns the software. Life also happens ON the crease line. How would you curate your last holiday? and some notes about my first map.